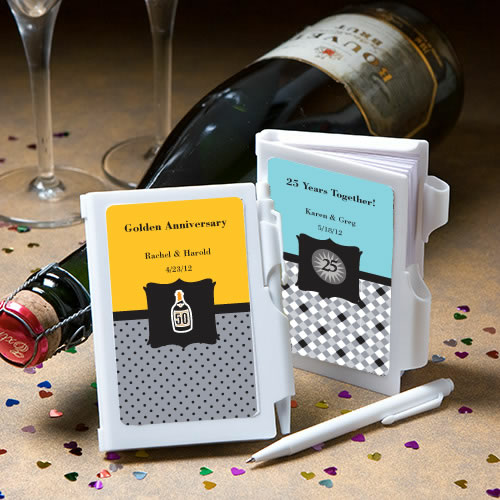 These personalized Anniversary notebook favors make terrific and useful party favors for your guests. Each personalized anniversary notebook favor measures 3.25 x 4.25 inches and features a cover, designed to display your personalized label, that opens to reveal a blank white notepad inside and an easily accessible white pen attached. Personalized labels are self-sticking for easy application on the notebooks. Your notebook favors arrive bulk packaged. Please be aware that only the label is personalized.